Built in 1921 our stately georgian style inn is renowned for true southern hospitality. The legendary golf course architect donald ross created the 18 whole par 72 masterpieces at mid pines. In addition to the charming main hotel we offer villas overlooking the 10th fairway. On property we feature our classic donald ross designed golf course 4 lighted tennis courts and an indoor game room. Dining at mid pines is an enjoyable experience in our elegant dining room featuring signature menus from our chef and his culinary team. for breakfast and lunch enjoy bountiful buffets on the terrace overlooking the 18th green. our dinner menu varies nightly. After a round of golf and dinner retire to the pops lounge for a relaxing cocktail while you enjoy the view of our classic golf course. Mid pines is the perfect setting for banquets golf tournaments corporate conferences retreats christmas parties rehearsals and wedding receptions. Our conference center accommodates up to 200 people and our to make your event a success. Centrally located in the southeastern part of North Carolina in the heart of golf country. The resorts are located across from each other on Midland Road just one mile from the quaint historic downtown Southern Pines and four miles from the Village of Pinehurst. 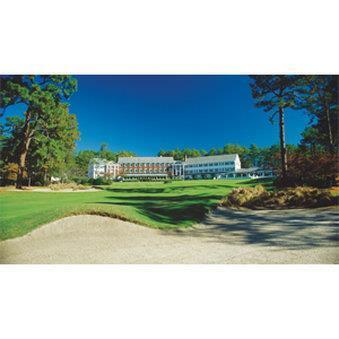 PinehurstEight golf courses make up the worlds largest golf resort full spa and dining. Southern PinesQuaint shops galleries and cafes grace the historic downtown area.